Opt for the charge package on the Leaf S and it's the best value of the group—but don't pay list price. For what's likely to be its last year before a major redesign, the original mass-market electric car largely stands pat. 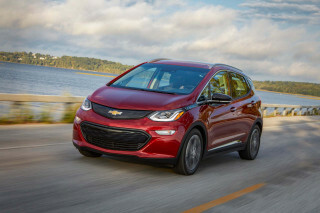 The Nissan Leaf does many things well, but it's certainly starting to show its age—especially as Chevrolet jumps up into the big leagues with its 238-mile range Bolt EV. Still, the Leaf, available in S, SV, and SL trim levels, remains worth a look. It's an icon in its own time, albeit one that hasn't been nearly as successful as its maker intended. Blame the lack of infrastructure, persistently fluctuating gas prices, or simply the compromises it requires from some consumers, but the Leaf will nonetheless go down as one of the most important cars of the 21st century. The battery-electric five-door hatchback sits on the footprint of a compact car, but has the interior room of a mid-size vehicle under federal rules because it is especially well-packaged. Like the Toyota Prius, which is a hybrid that requires gasoline to run, the all-electric Leaf's shape is distinctive and unique, which translates to polarizing for many shoppers and buyers. A sloping front replaces the grille a rectangular hatch over the electric charging ports, and its bug-eyed headlights sweep back almost to the windshield pillars. At the back, vertical ribbons of LED taillights flank the tailgate. Inside, the Leaf is more conventional aside from a chintzy gear knob that requires a little acclimation. The base S trim level isn't exactly opulent, but higher end models feature a big infotainment screen and surprisingly nice leather trim. On the road, a Leaf operates and drives like a normal compact car—albeit a quiet one—though many of its controls have a slightly remote feel, since virtually all of them control a device that's electrically actuated. Although its 0-60 mph sprint of a hair less than 10 seconds isn't impressive, the Leaf's immediate torque is appreciable around town, where it'll beat even sports cars off the line. It's also very quiet at lower speeds since its electric motor transmits no rumble into the cabin. The Leaf keeps up with traffic, is easy to drive, carries four people comfortably—and five when needed—and comes with the usual features and accessories found on any compact car. Leaf comfort, safety, and features. You might be surprised with the Leaf's interior room. Thanks to its flat battery and the fact that it doesn't need a gas tank, it offers more space inside than its compact dimensions might suggest. Front seat passengers are treated to upright thrones that don't adjust for height on the base S trim level but are heated on all models. The back seat offers good room for two adults or three in a pinch, and even the Leaf's cargo area is deeper than you might expect. On the safety front, however, the Leaf is let down in part by its humble roots and in part by its age—its basic design has changed little since 2011. The NHTSA gives it four stars overall, while the IIHS scores it a disconcerting "Poor" in the challenging frontal small overlap test. 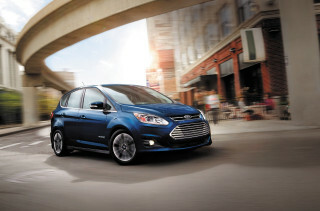 The Leaf also offers no active safety tech, like automatic emergency braking. S models are fairly skimpy with features, which may be a surprise considering they're over $33,000 once the important Charge Package is added. That package is standard on SV and SL models, and it slices Level 2 (240-volt) charging to just over 5 hours from 8 hours and it allows for Level 3 charging. The big change for 2017 is that all models now feature 107 miles of all-electric range, according to the EPA, thanks to a 30-kwh battery that was made standard on every trim level very late in the 2016 model year. Homely—there's really no better way to describe the Leaf. It's better inside. The Nissan Leaf remains distinctive inside and out, but it's not exactly the kind of car that will have you stopping in your tracks to stare at it. One thing's for sure, the Leaf hasn't changed since it was unveiled all the way back in 2010. Sure, Nissan has substituted a few color shades over the years, and it has redesigned the Leaf's wheels, but a 2017 looks just like a 2011—and, given its appalling resale value, a used Leaf is among the cheapest cars money can buy. The tall Leaf casts a longer shadow than a typical compact hatchback, but its design is mostly aero-driven in order to save fuel. Big bug-eyed headlights are startling (and look startled, for that matter). There's no grille, just a wedge-shaped snout that angles down toward the bumper with a boxy hatch in the center that reveals either one or two charging sockets, depending on if you've selected the Charge Package. The headlights that stick out do so to sweep air around the front fascia to reduce aerodynamic drag. At the rear, tall tail lamps flank a conventional hatch. Unlike some more style-driven cars, Nissan has seen fit to keep a low belt line on the Leaf that helps out with visibility from the driver's seat. The Leaf's interior feels typical economy car, aside from surprisingly nice material on the front door panels. It may be an electric car, but its controls are logical and easy to sort through, aside from a wart of a gear lever sprouting from the center console. Ergonomically, there are few quirks aside from some secondary switches gathered to the left of the steering wheel. The Leaf's interior blends radical design touches and conventional Nissan economy-car hardware. The two-level instrument panel comprises a cluster behind the wheel with a digital speedometer, temperature gauge, and clock, plus a large rectangular touchscreen monitor in the center of the dash that displays driving range, energy usage, maps, nearby recharging points, and more in real time. The base Leaf S has a smaller audio system that doesn't display any car functions but contains a volume knob—something SV and SLs lack. Zippy, but essentially an economy car, the Leaf isn't an exceptionally great riding or handling car. The Nissan Leaf isn't the kind of car with which an enthusiast will bond, but it's especially quiet and refined and it's more entertaining to pilot than its eco-friendly credentials might suggest. Refinement is a Leaf forte; it's smooth, quiet, and calm under all circumstances—even high-speed highway driving that will rapidly deplete its charge. Aside from some tire rumble, it makes little noise. That's as much a testament to its electric powertrain as it is to the efforts Nissan's engineers have made to quell wind roar. In a gas car, wind whistle is hidden by the thrum of the engine. But in an electric, every noise needs to be suppressed. Novices may be perplexed by the Leaf's mouse-esque driving mode selector that sits on its center console. A tug back and left puts the car into drive, and another tug puts it into brake regeneration mode (which many Leaf drivers wind up using in order to squeeze the most out of a charge). If you need to, you get can brisk acceleration out of a Leaf, but you have to push hard on the accelerator—an energy-saving measure to ensure that degree of power is really wanted. Eco mode, selected via buttons on its steering wheel, retards the accelerator even further. 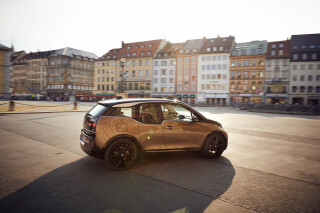 The 80-kw (107-horsepower) electric motor that powers the front wheels produces a healthy 187 pound-feet of torque, drawing its energy from the 30-kwh lithium-ion battery pack just under the cabin floor. As for range, Leaf buyers need to learn that battery-powered cars are highly sensitive to driving habits and temperature, and each can affect range in a major way. Accelerate gently, coast down to stops, and plan ahead to avoid sudden acceleration or hard braking, and you'll be fine. 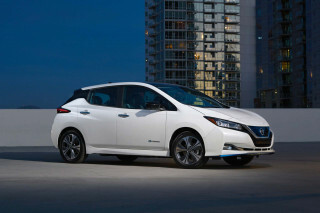 Nissan has tuned the Leaf's regenerative braking to simulate the behavior of a conventional automatic-transmission car. The "B" mode increases the regeneration to mimic engine braking. 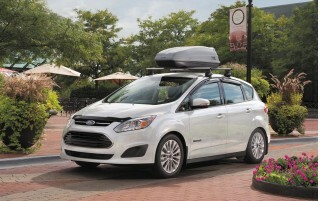 Last year's smaller battery is gone, meaning all Leafs check in at 107 miles of range. 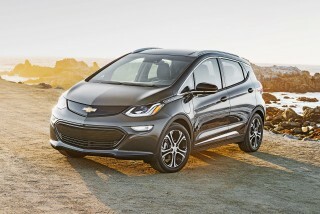 That was impressive last year, but now that Chevrolet boasts 238 miles from its Bolt EV, the Leaf feels like yesterday's news. There's an Eco mode for greater efficiency, which cuts maximum available power by 10 percent—although its effect feels much greater. For safety in sudden emergencies, flooring the accelerator overrides Eco mode, temporarily. But there's no hiding that the Leaf is an economy-oriented car. Its electric steering is nicely weighted but numb, with limited road feedback. It offers a removed experience, although we commend its 17 foot turning circle since there's no engine to get in the way of the front wheels. With its heaviest component (the battery pack) carried at the car's lowest point, the Leaf has little body roll. But we found it sensitive to side winds, presumably because it's a tall car on small tires (especially the Leaf S base model, which uses 16-inch wheels). Overall, the Leaf's lack of road feel or control feedback makes "appliance-like" the most suitable adjective for the Leaf. It's fine, but it's the antithesis of anything sporty. When you need torque to pass other cars, it's there if you floor the accelerator, but it's still far from lightning-fast in the crucial 40-to-70-mpg range. Higher speeds in a Leaf make the car feel breathless; they also burn through battery range. Steering feel gets heavier and acceleration falls noticeably above 50 or 60 mph as wind drag rises. While the Leaf is fine for freeway commuting, it may be most useful in around-town use up to 50 mph or regular commutes of predictable distances. Top speed is capped at 90 mph. Despite some handling shortfalls, the Leaf feels just like a regular car that happens to be very, very quiet. It's a convincing sales tool for the benefits of electric cars, and many Leaf owners become de facto evangelists for the joys of plug-in travel, offering rides and drives to friends, relatives, neighbors, and colleagues. The Leaf's seats are comfortable in all four places, but its interior feels downmarket. 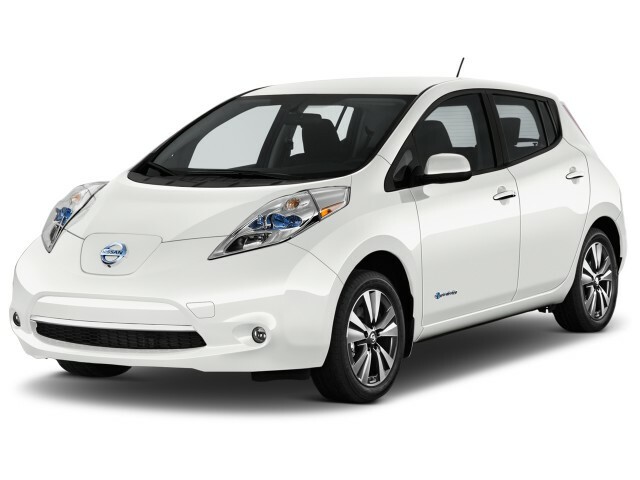 What's most impressive about the Leaf is its silence, but it generally does a good job of convincing your fellow passengers that it's a "normal" compact car, with room for four adults and their luggage. Front seat passengers have chair-like buckets that offer good support even on the base Leaf S. Cloth upholstery covers the S and SV, although the SV's trim is made from recycled material and feels a little richer than the budget grade S material. The rear seat offers good space for adults at the outboard positions, and limited driveline intrusion means that even the occasional middle seat passenger will be satisfied. The driver has a broad view out thanks to a large windshield and even little windows around the side mirrors, but the roof pillars up front are surprisingly thick (especially given the Leaf's subpar safety ratings). The dashboard is covered in cheap, hard plastic, which is echoed in the center console and much of the door panels, although it's worth noting that the front seat passengers have more soft touch material on the doors than those in the rear. S models feature a basic audio system with a small 5.0-inch LCD screen, while SV and SLs get a full infotainment system with a 7.0-inch touchscreen—albeit without a volume knob. Chintzy carpet and a budget headliner add to the low-rent feel inside, especially given the Leaf's hefty sticker prices. Fortunately, big discounts are readily available, so the Leaf's sticker price isn't close to what savvy consumers will pay. The Leaf is definitely behind the times when it comes to safety. Given that the Leaf still boasts one of the most sophisticated powertrains on the market, we're surprised at its subpar safety ratings. They're a reminder that, engine, battery, and transmission aside, the Leaf is basically a budget compact car with the safety, unfortunately, to match. The Leaf is only adequate in its safety ratings, with the IIHS having given its performance on its tough small-overlap front crash test the group's lowest rating of "Poor." Before that test was instituted, the Leaf's other ratings—all the highest "Good"—had earned it a Top Safety Pick designation, but times change and standards evolve. The NHTSA gives the 2016 Leaf four stars out of five, not only as an overall rating, but also for frontal crash, side crash, and rollover safety tests. The 2017 model has been only partially tested. While six airbags and stability control are standard, the Leaf doesn't exactly wow with its additional safety equipment. There's no adaptive cruise control, lane departure warning, or automatic emergency braking. At least pedestrians will be alerted to the Leaf's approach; it produces a sound below 20 mph to warn bystanders that it's creeping up on them, something that's necessary given its engine makes virtually no sound. Base models are just that, but the SL comes close to approximating a luxury car. The Leaf largely carries over from previous years into 2017, with the same three trim levels—albeit with one notable improvement in that all models now feature the same 30-kwh battery pack that gives the car 107 (versus 84) miles of range. The S rides on 16-inch steel wheels with hubcaps, a 3.3-kw onboard charger, Bluetooth phone (but not streaming audio) connectivity, a proximity key, and a rearview camera, a 5.0-inch display for infotainment, plus heated front seats included so that buyers can conserve some battery charge by not using the cabin heater. 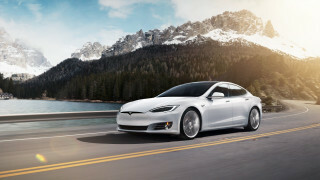 An optional Charge Package adds a 6.6-kw charger. From there, the SV adds a heated and leather-wrapped steering wheel (which was once included on the S), alloy wheels, and a 7.0-inch infotainment system that includes navigation and some apps that help owners stay in touch with their cars via a smartphone app. The SV includes the 6.6-kw charger but offers as an option a package that groups a surround-view camera system with a Bose-branded audio system. The SL, meanwhile, tops the range with leather upholstery, heated rear seats, LED headlights, and fog lights, and it offers the same surround-view camera system and Bose stereo as an option. Owners can control every Leaf except the base Leaf S with a smartphone app that shows real-time information on the car's operation and charging status. Sophisticated owners can set a Leaf to charge only when energy rates are cheapest, usually in the wee hours—though they will have to enter their local rate structures manually. Notably, Leafs don't communicate with electric utilities about rates. It lags the Chevy Volt, but the Leaf is still very efficient. Until Chevrolet released the Bolt EV, the Leaf was seen as the sensible, sober, affordable alternative to the undeniably faster and sexier Tesla Model S.
The Leaf has another distinction: it's by far the highest-volume electric car ever built. 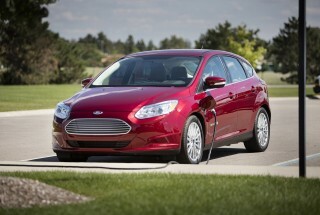 The EPA rates the efficiency of all Leafs at 112 MPGe, with a 107-mile overall range. Using grid electricity for driving brings enormous cost savings. Every 100 miles, a 25-mpg gasoline car consumes $8 of gasoline (assuming $2/gallon prices). Covering the same 100 miles in an electric car costs just $3 at the average U.S. electricity rate of 12 cents per kilowatt-hour. All Leafs, except the lower-range base Leaf S, come with a 6.6-kw onboard charger that can recharge a fully depleted battery in about four hours from a 240-volt Level 2 charging station. The 3.3-kw charger on the Leaf S takes roughly twice as long. 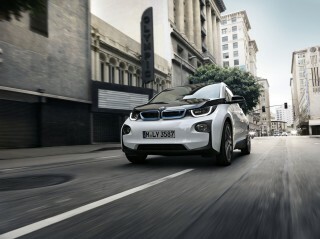 A great car with great value and am excited to be part of the electric car network.